The elevated areas of the Upper Hunter received light to heavy snowfalls on Saturday night/Sunday morning leaving the nearby hills around Muswellbrook, Scone and Murrurundi a spectacular white. Light snow falls were reported in Murrurundi itself on Saturday night but did not settle. The snow settled to elevations 500 - 600m, making it the lowest and widespread snowfall since August 1996. 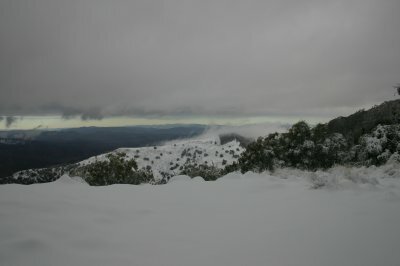 The Barrington Tops received a heavy dumping with depths of 12cm at 900m and 25 - 30cm at 1400m on Sunday. The snow continued to fall throughout Sunday and Monday morning on the Barrington Tops but the weather had cleared around other areas. The heavy snow made the roads impassable by Sunday afternoon across the Tops. Even 4WD's were struggling to plough through the ice and drifts on the roads which where deeper then 50cm in places. A 4 car pile up on the steep road leading to the Dingo Fence (1100m) resulted in a car nearly sliding off a 400m drop. Photo taken at Dingo Fence lookout on the Barrington Tops (Sunday morning).